These 56 cm (22 inch) Carbon Black Miflex Xtreme Low Pressure (LP) BCD/Inflator/Jacket hoses are suitable for most ranges of Inflator, Dry-suit, BCD's and Jackets where a standard quick release coupler is utilised. Miflex Xtreme low pressure BCD/Inflator/Jacket hoses are supplied fitted with a standard Quick Disconnect Seatec style female side-lock coupler fitting, with an internal Schrader type valve, that accepts the standard BC inflator male QD post. This is the most common design of inflator coupling used in scuba diving. At the other end is a 3/8" UNF male thread to connect the hose to a low pressure port on the 1st stage regulator. This inflator hose fitting is suitable for the majority of BCD and drysuit applications, but there are a range of fittings that require a different Quick Disconnect fitting. These we accommodate in our range with the use of LP adaptors that can be fitted to our regulator hoses (to convert them to an inflator hose). Light and extremely flexible. Reduce baggage weight when traveling. 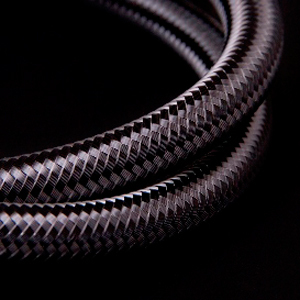 Kink-resistant design – tie a Miflex Xtreme LP hose into a knot and air flow remains continuous. UV resistant out of the water extending the life span of the hose. Premium packaging which doubles as a water resistant document wallet or dry bag for phone or car keys - $8 value. Miflex hoses are fully recognisable with the Miflex name clearly shown on every fitting, as required under EN250 for product traceability. The Miflex Xtreme high performance range of diving hoses has been developed in cooperation with expert divers for a superior in depth performance. A team of Miflex engineers analysed the weak points of traditional low-pressure diving hoses. The fruit of their research is the Miflex Xtreme high performance range. Miflex Xtreme hoses feature an external nylon safety braiding designed to resist the snags and abrasions that divers can often encounter. The patent Pending Miflex Xtreme double braiding also resists UV rays out of the water, thus extending the lifespan of the hose. Performance and durability in extreme situations. You could tie an Xtreme hose in a knot and the air flow through the hose would remain continuous. Now that's versatility! The Miflex Xtreme also achieves a higher burst pressure almost double when compared to traditional hoses. And in the event of a physical breach, Miflex Xtreme hoses actually work to reduce the amount of air lost. How? The advanced Miflex Xtreme nylon safety braiding actively shrinks under pressure, reducing the rate of air loss and buying valuable time. Miflex Xtreme hose production is carried out to the highest quality and standards on our automated assembly and testing line. Each and every hose is subject to more than 30 individual safety and specification checks, automatically during production, to deliver a product of the highest quality. Miflex are very proud of ther Xtreme range of diving hoses, which have been created and developed specifically for the diving market. Miflex only manufacture theirr products from the highest quality materials and manufacture to the highest levels of quality available, in their Italian factory. You can recognise a Miflex hose, as they are clearly marked with the Miflex name as all products should show you where they are made, as well as the suitable standards and pressure ratings, including the important EN250 marking. Miflex offer a full warranty on their hoses and continually review our products to assess and improve any areas as required to suit today's changing diving market and it's requirements. Miflex provide their hoses in Miflex branded dry-bags. Each bag contains an insert with details of the quality and also information on installation and safety as well as where you can register your purchase of diving hoses. Miflex hoses are used as standard on equipment by many of leading diving brands. If you want the best, ensure you are diving Miflex Xtreme. We recommend that the fitting and installation of all diving hoses should be made by a competent person and using the correct tools. As such we would suggest this is done by a recognised service centre like The Scuba Doctor. All installation should be made in accordance with the manufacturers recommendations and instructions. If you are unsure in any way about the installation, please visit The Scuba Doctor for advice. Miflex Xtreme LP inflator hoses are available in a wide range of lengths and colours. Miflex Xtreme Regulator Hose 90 cm - 36" (Carbon Black) - 3/8"